What would your life be like if you were a Jewish person living in Nazi Germany in 1940? You might be forced to leave your home with only what you and your family could carry. You might even be killed by members of the Nazi party. The Holocaust is a grim period in human history. More than 11 million people, including 6 million Jewish people, died at the hands of the Nazis. 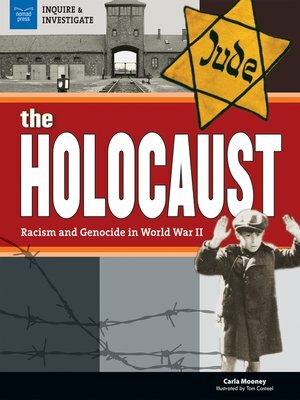 In The Holocaust: Racism and Genocide in World War II, readers ages 12 to 15 learn about the long history of anti-Semitism, the rise of Adolf Hitler and the Nazi party, the increasing persecution of Jewish people and other populations, and the events of The Final Solution," the attempt to exterminate an entire race of people through industrialized death camps. Projects such as writing letters in the voices of teenagers of different races who lived in the 1930s help infuse the content with realism and the eternal capacity for hope. In-depth investigations of primary sources from the period allow readers to engage in further, independent study of the times. Additional materials include links to online primary sources, a glossary, a list of current reference works, and Internet resources.